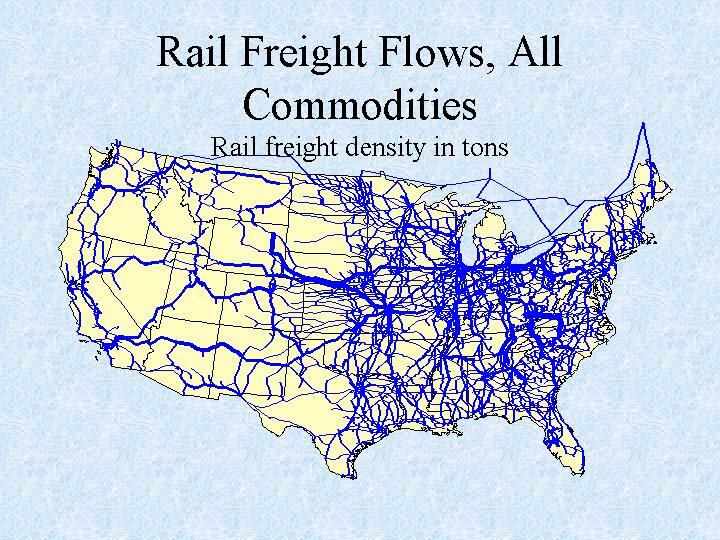 The inland waterway transportation system connects product sources and markets with a siretch of water more than 10,000 miles long. 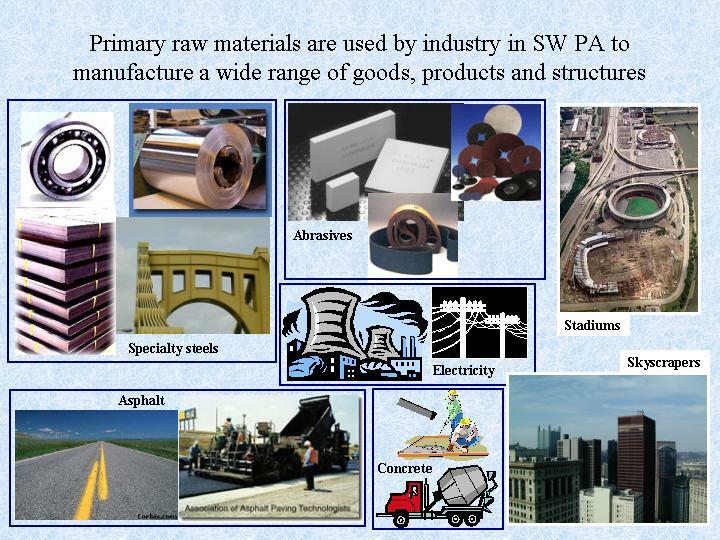 five-borne commodities include coal, steel, alloys, ores, petrcchemicals, aggregates and primary manufactured goods. 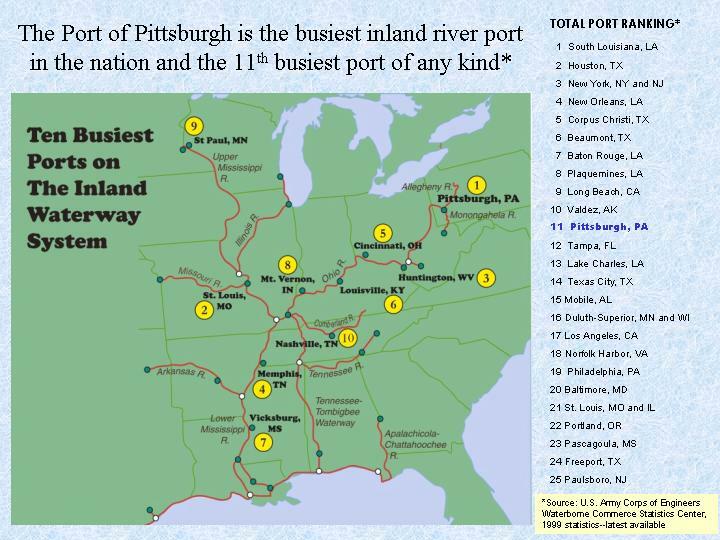 The map shows the distance between port of Pittsburgh and other major cities. 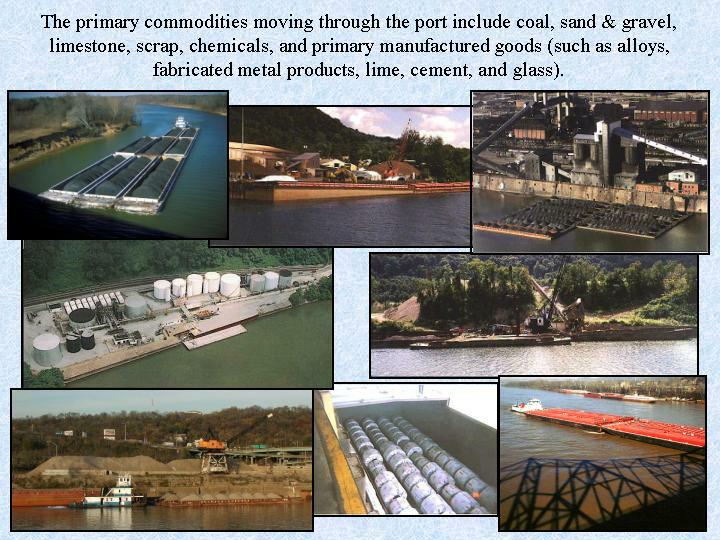 The primary commodities moving through the port include coal, sand & gravel, limestone, scrap, chemicals, and primary manufactured goods (such as alloys, fabricated metal products, lime, cement, and glass). 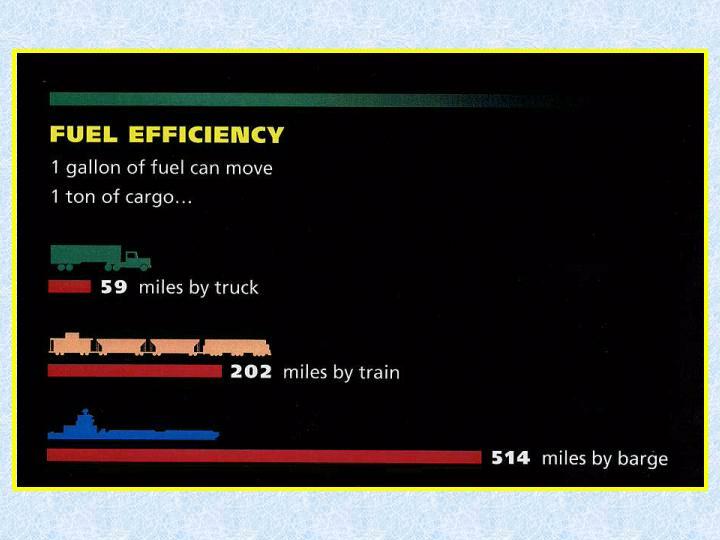 Fuel efficiency: 1 gallon of fuel can move 1 ton of cargo 59 miles by truck, 202 miles by train; and 514 miles by barge. 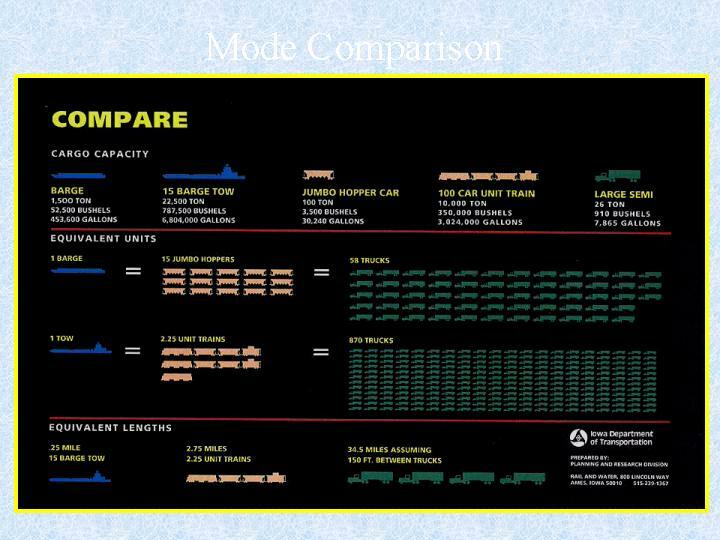 Compare water transportation with truck and rail. 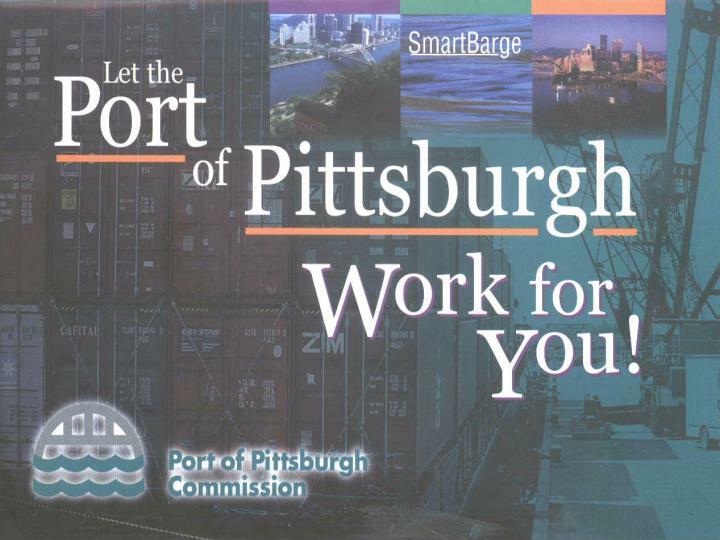 Port of Pittsburgh work for you. 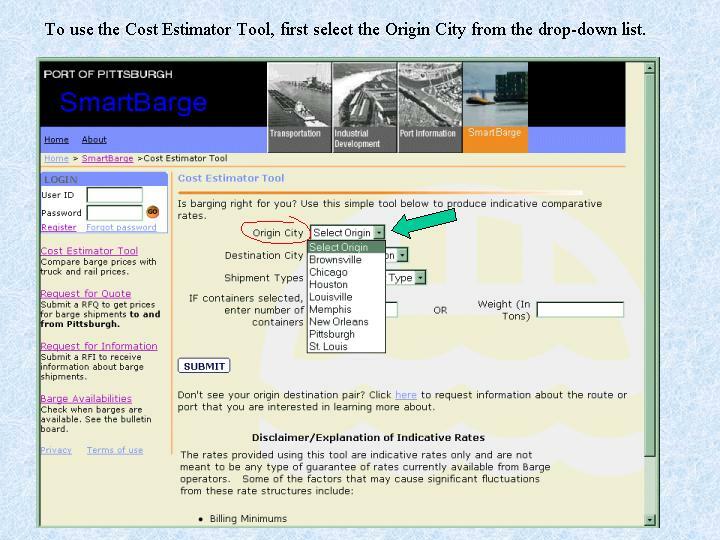 To use the Cost Estimator Tool, first select the Origin City from the drop-down list. 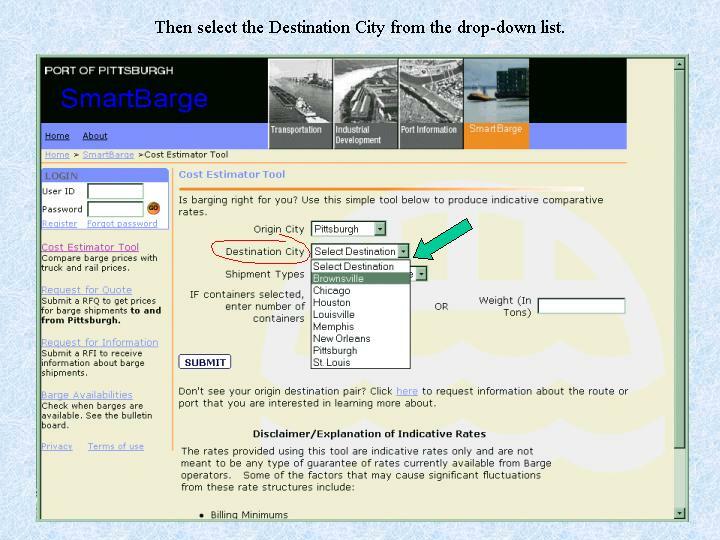 Then select the Destination City from the drop-down list. Then select the Shipment Type from the drop-down list. 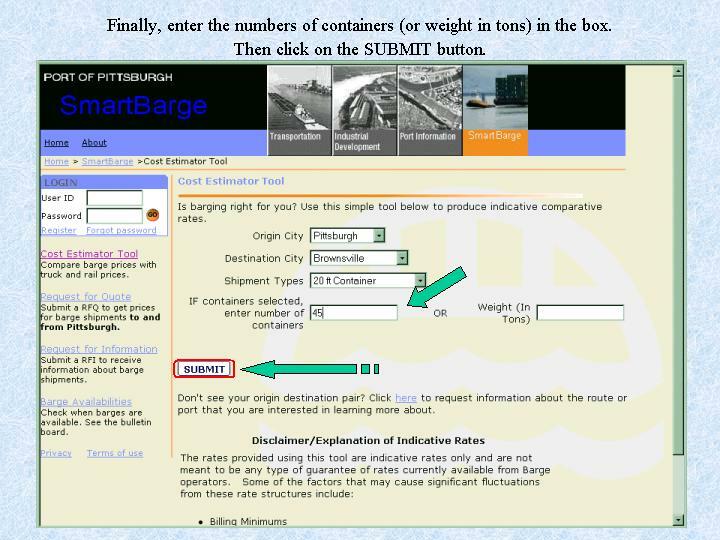 Finally, enter the numbers of containers (or weight in tons) in the box. 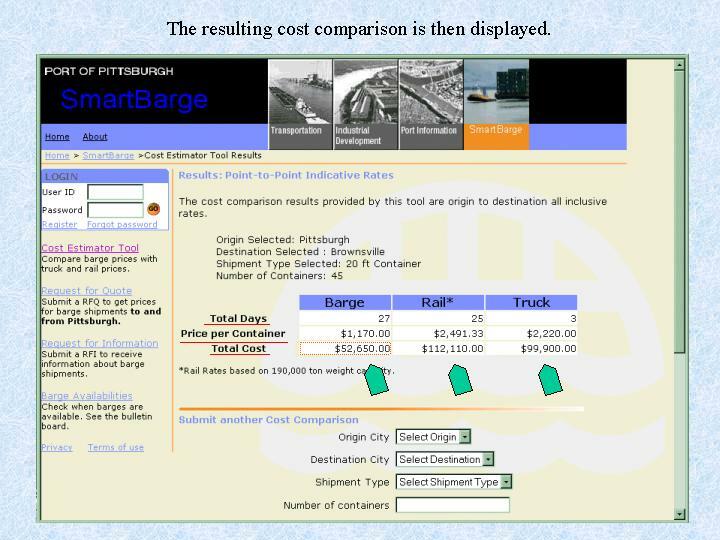 The resulting cost comparison is then displayed. 1. 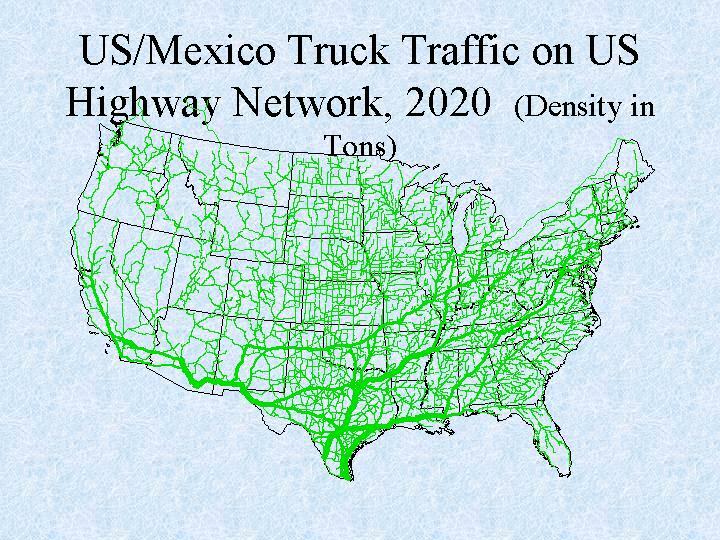 Consider waterways as potential solutions in the analysis of all modal traffic congestion problems. 2. 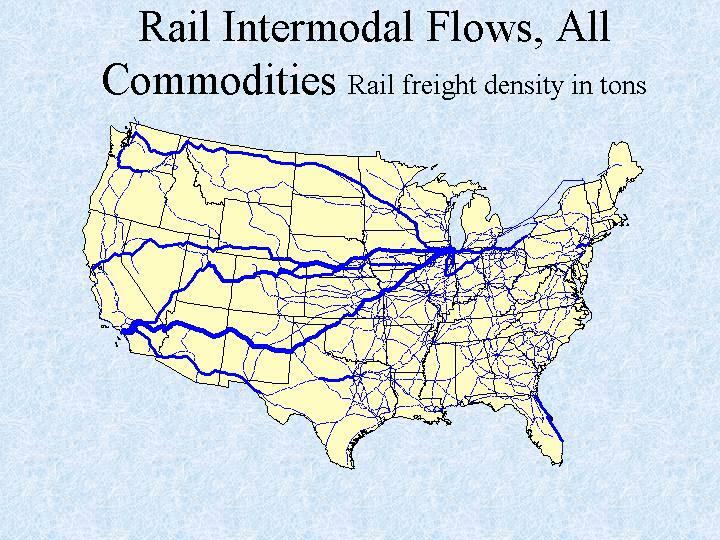 Designate the U.S. inland and intra-coastal waterways as corridors of critical national transportation importance. 3. 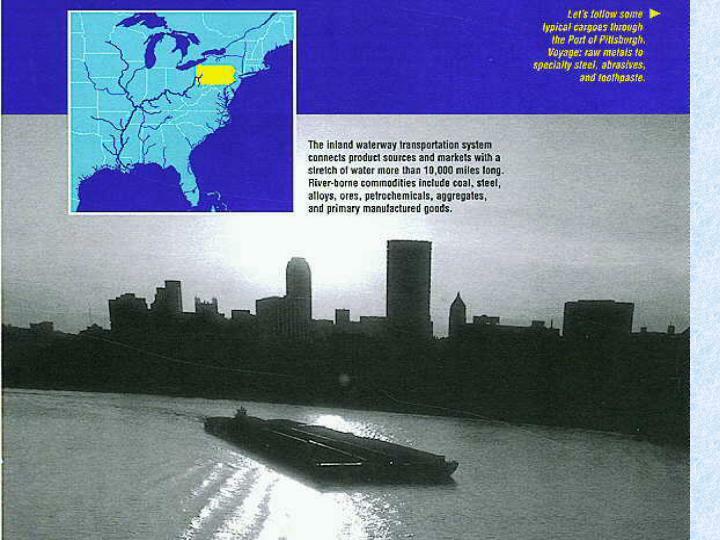 Expend funds already collected from the Inland Waterway User Fund (with a current surplus of $400 million) and the Harbor Maintenance Trust Fund (with a surplus of $1.6 billion as of December 2000) for the purposes for which they were collected. 4. 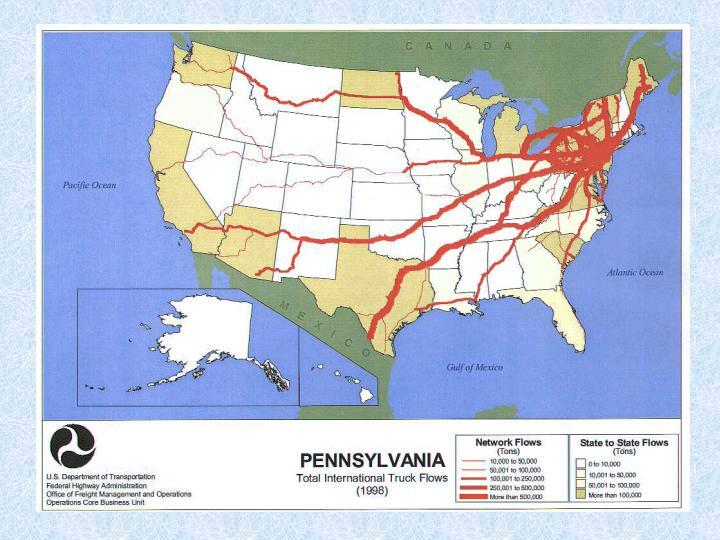 Dedicate a portion of the U.S. highway gas tax funds to port-intermodal connector development (based upon a “freight factor” relating to the percent of truck traffic miles generated by ports, including possible dedicated truck lanes and improvements to intermodal connectors that may or may not be part of the NHS, federal or state highway systems). 5. 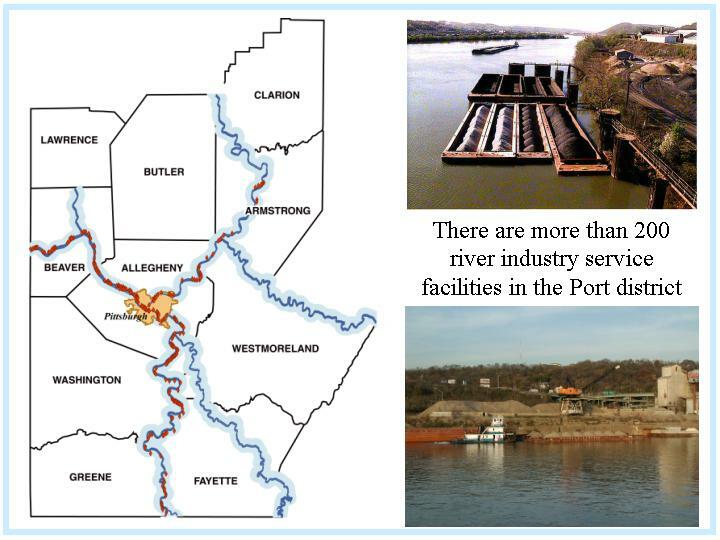 Dedicate a portion of the $22 billion in maritime user fees in the general fund to finance the public match for port and waterway projects. 6. 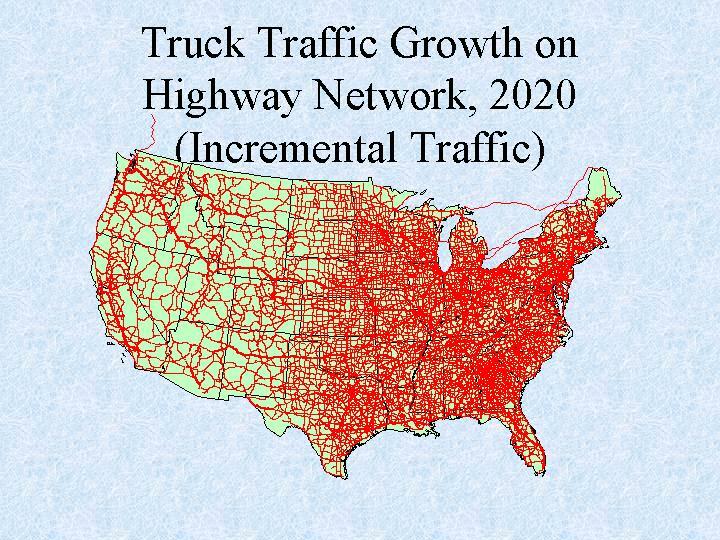 Dedicate a portion of the $22 billion in maritime user fees for projects that divert cargo from high-energy-consuming and high-pollution-emitting modes to less polluting modes (based on quantifiable “public benefit factors” such as reducing highway congestion, accidents, pollution and fuel consumption). 7. 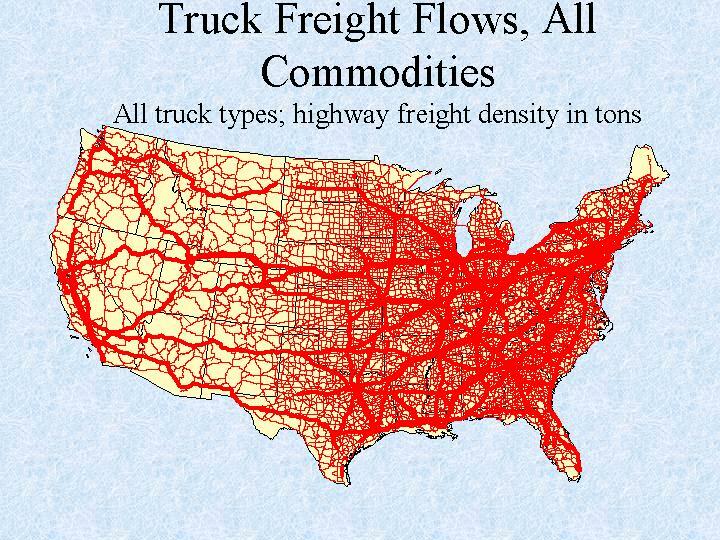 Provide tax credits incentives for private investments that meet the above quantifiable “public benefits factor” such as container rail facilities (less than 400 miles from existing container hubs) and container-on-barge systems and similar incentives for the shippers that use those systems. 8. 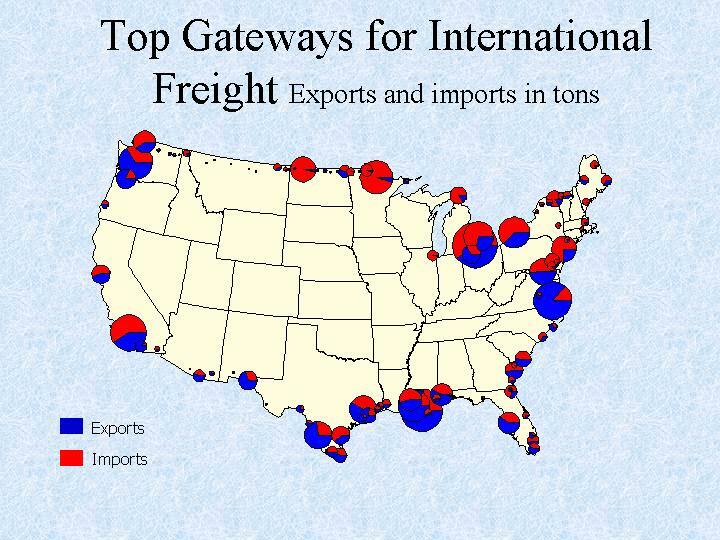 Allow ports to form multi-jurisdictional transportation intermodal finance infrastructure authorities, (similar to the Alameda Corridor project, that would allow the ports to access, leverage and flex funds from existing TEA-21 programs, MARAD Title XI loans and Rail Rehabilitation Improvement Fund programs and their successor programs which may be approved by Congress). 9. 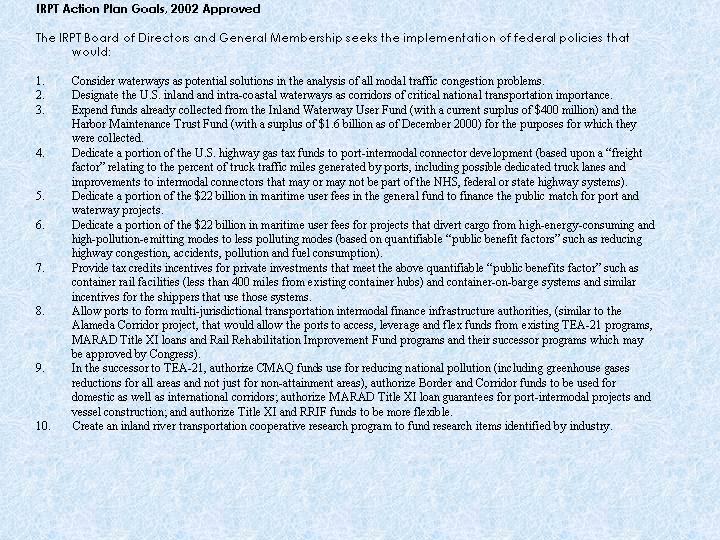 In the successor to TEA-21, authorize CMAQ funds use for reducing national pollution (including greenhouse gases reductions for all areas and not just for non-attainment areas), authorize Border and Corridor funds to be used for domestic as well as international corridors; authorize MARAD Title XI loan guarantees for port-intermodal projects and vessel construction; and authorize Title XI and RRIF funds to be more flexible. 10. 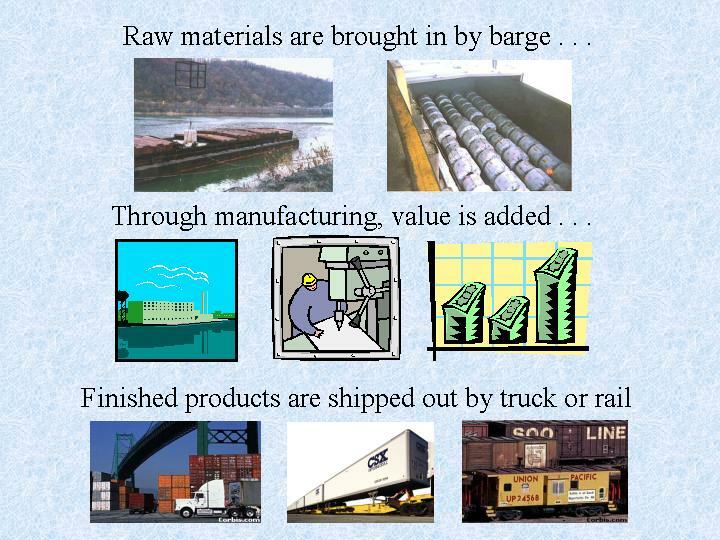 Create an inland river transportation cooperative research program to fund research items identified by industry. 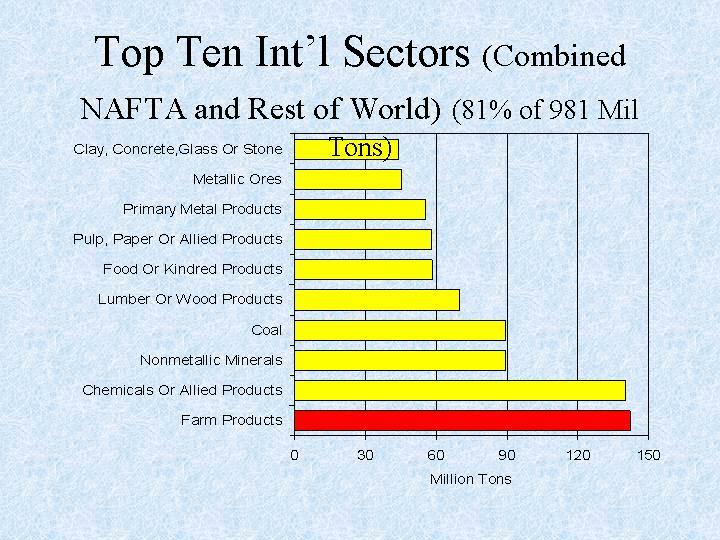 • Change our own business practices. • Recognition as a corridor. 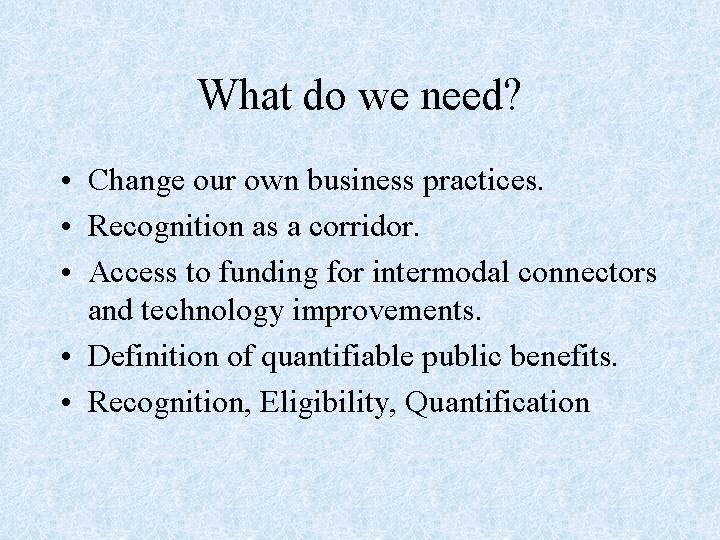 • Access to funding for intermodal connectors and technology improvements. 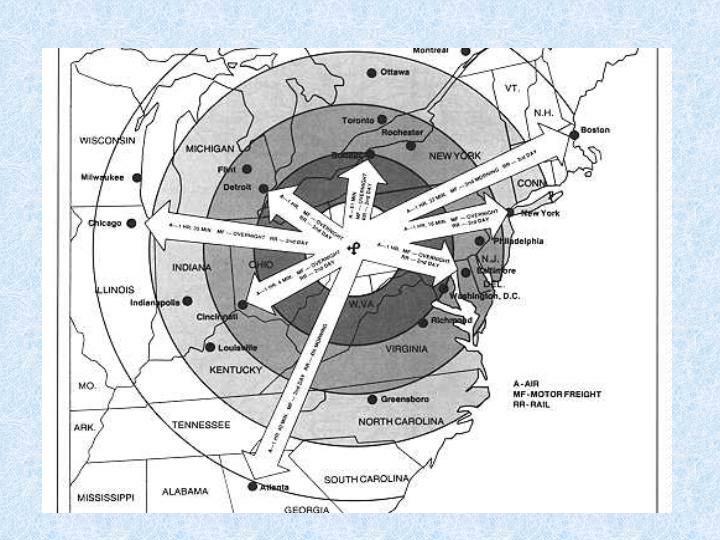 • Definition of quantifiable public benefits.